Note: Destroyed reefs: 90% of the corals lost and unlikely to recover soon; Reefs at a critical stage: 50% to 90% of corals lost or likely to be destroyed in 10 to 20 years; Reefs at threatened stage: 20 to 50% of corals lost or likely to be destroyed in 20 to 40 years. plants and 10 to 213 vertebrates in Indo-Burma could become extinct (Malcolm et al., 2006). As a consequence of climate change, no significant change in spatial patterns of productivity of the forest ecosystems in North-East China is projected (Liu et al., 1998). The areal coverage of broad-leaved Korean pine forests is projected to decrease by 20 to 35% with a significant northward shift (Wu, 2003). About 90% of the suitable habitat for a dominant forest species, beech tree (Fagus crenata), in Japan could disappear by the end of this century (Matsui et al., 2004a, b). The impact of elevated atmospheric CO2 on plant biomass production is influenced by the availability of soil nitrogen and deposition of atmospheric nitrogen (Oren et al., 2001; Hajima et al., 2005; Kitao et al., 2005; Reich et al., 2006). The overall impact of climate change on the forest ecosystems of Pakistan could be negative (Siddiqui et al., 1999). The observations in the past 20 years show that the increasing intensity and spread of forest fires in North and South-East Asia were largely related to rises in temperature and declines in precipitation in combination with increasing intensity of land uses (see Section 10.2.4.4). Whether this trend will persist in the future or not is difficult to ascertain in view of the limited literature on how the frequency and severity of forest and brush fires will likely respond to expected increase in temperature and precipitation in North and South-East Asia (see Section 10.3.1). The uncertainty lies on whether the expected increase in temperature would be enough to trigger more frequent and severe fires despite the projected increase in precipitation. One study on the impacts of climate change on fires show that for an average temperature increase of 1°C, the duration of wild fire season in North Asia could increase by 30% (Vorobyov, 2004), which could have varying adverse and beneficial impacts on biodiversity, forest structure and composition, outbreaks of pest and diseases, wildlife habitat quality and other key forest ecosystem functions. 30%, except in high mountains and in Gobi where a marginal decrease in pasture productivity is projected by the end of this century (Tserendash et al., 2005). Traditional land-use systems should provide conditions that would promote greater rangeland resilience and provide a better management strategy to cope with climate change in the region to offset the potential decrease of carbon storage and grassland productivity in the Mongolian Steppe under various climate scenarios (Ojima et al., 1998). The location and areas of natural vegetation zone on the Tibetan Plateau will substantially change under the projected climate scenarios. The areas of temperate grassland and cold-temperate coniferous forest could expand, while temperate desert and ice-edge desert may shrink. The vertical distribution of vegetation zone could move to higher altitude. Climate change may result in a shift of the boundary of the farming-pastoral transition region to the south in North-East China, which can increase the grassland areas and provide favourable conditions for livestock production. However, as the transition area of farming-pastoral region is also the area of potential desertification, if protection measures are not taken in the new transition area, desertification may occur (Li and Zhou, 2001; Qiu et al., 2001). More frequent and prolonged droughts as a consequence of climate change and other anthropogenic factors together will result in the increasing trends of desertification in Asia. The permafrost thawing will continue over vast territories of North Asia under the projected climate change scenarios (Izrael et al., 2002b). The transient climate model simulations (Pavlov and Ananjeva-Malkova, 2005; FNCRF, 2006) show that the perennially frozen rocks and soils (eastern part of the permafrost terrain) and soils (western part of the terrain) may be completely degraded within the present southern regions of North Asia (see Figure 10.5). In northern regions, mean annual temperature of frozen soil and rocks and the depth of seasonal thawing will increase in 2020 by as much as 4°C for the depth of 0.8 m and by at most 2.2°C for the depth of 1.6 m (FNCRF, 2006; Izrael et al., 2006). The change in the rock and soil temperatures will result in a change in the strength characteristics, bearing capacity, and compressibility of the frozen rocks and soils, thaw settlement strains, frozen ground exploitability in the course of excavation and mining, generation of thermokarst, thermal erosion and some other geocryological processes (Climate Change, 2004). Figure 10.5. 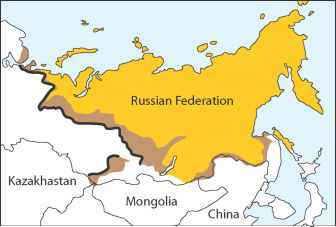 The projected shift of permafrost boundary in North Asia due to climate change by 2100 (FNCRF, 2006). decrease in size, move upward and face degradation by the end of this century (Wu et al., 2001). For a rise in surface temperature of 3°C and no change in precipitation, most Tibetan Plateau glaciers shorter than 4 km in length are projected to disappear and the glacier areas in the Changjiang Rivers will likely decrease by more than 60% (Shen et al., 2002). Climate change poses substantial risks to human health in Asia. Global burden (mortality and morbidity) of climate-change attributable diarrhoea and malnutrition are already the largest in South-East Asian countries including Bangladesh, Bhutan, India, Maldives, Myanmar and Nepal in 2000, and the relative risks for these conditions for 2030 is expected to be also the largest (McMichael et al., 2004), although in some areas, such as southern states in India, there will be a reduction in the transmission season by 2080 (Mitra et al., 2004). An empirical model projected that the population at risk of dengue fever (the estimated risk of dengue transmission is greater than 50%) will be larger in India and China (Hales et al., 2002). Also in India and China, the excess mortality due to heat stress is projected to be very high (Takahashi et al., 2007), although this projection did not take into account possible adaptation and population change. There is already evidence of widespread damage to human health by urban air quality and enhanced climate variability in Asia. Throughout newly industrialised areas in Asia, such as Chongqing, China, and Jakarta, Indonesia, air quality has deteriorated significantly and will likely contribute to widespread heat stress and smog induced cardiovascular and respiratory illnesses in the region (Patz et al., 2000). Also, the number of patients of Japanese cedar pollen disease is likely to increase when the summer temperature rises (Takahashi and Kawashima, 1999; Teranishi et al., 2000). The negative influence of temperature anomalies on public health has been established in Russia (Izmerov et al., 2004) and in the semi-arid city, Beirut (El-Zein et al., 2004). 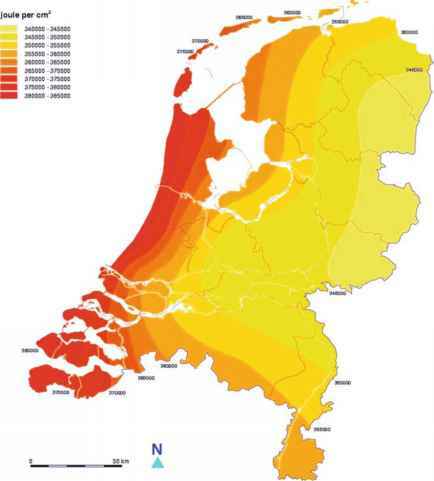 Exposure to higher temperatures appears to be a significant risk factor for cerebral infarction and cerebral ischemia during the summer months (Honda et al., 1995). Natural habitats of vector-borne diseases are reported to be expanding (Izmerov et al., 2004). Prevalence of malaria and tick-borne encephalitis has also increased over time in Russia (Yasukevich and Semenov, 2004). The distribution of vector-borne infectious diseases such as malaria is influenced by the spread of vectors and the climate dependence of the infectious pathogens. There are reports on the possible effects of pesticide resistance of a certain type of mosquito on the transition of malaria type (Singh et al., 2004). The insect-borne infectious diseases strongly modulated by future climate change include malaria, schistosomiasis, dengue fever and other viral diseases (Kovats et al., 2003). Oncomelania is strongly influenced by climate and the infection rate of schistosomiasis is the highest in the temperature range of 24°C to 27°C. Temperature can directly influence the breeding of malaria protozoa and suitable climate conditions can intensify the invasiveness of mosquito (Tong and Ying, 2000). A warmer and more humid climate would be favourable for propagation and invasiveness of infectious insect vector. Serious problems are connected with the impact of air pollution due to Siberian forest fires on human health (Rachmanin et al., 2004). Warmer sea-surface temperatures along coastlines of South and South-East Asia would support higher phytoplankton blooms. These phytoplankton blooms are excellent habitats for survival and spread of infectious bacterial diseases such as cholera (Pascual et al., 2002). Water-borne diseases including cholera and the suite of diarrhoeal diseases caused by organisms such as Giardia, Salmonella and Cryptosporidium could also become common with the contamination of drinking water. Precipitation increase and frequent floods, and sea-level rise in the future will degrade the surface water quality owing to more pollution and, hence, lead to more water-borne infectious diseases such as dermatosis, cardiovascular disease and gastrointestinal disease. For preventive actions, assessment of climate change impacts on nutritional situation, drinking water supply, water salinity and ecosystem damage will be necessary. The risk factor of climate-related diseases will depend on improved environmental sanitation, the hygienic practice and medical treatment facilities. illustrate the approach through theoretical discussion and case studies based in Vietnam. The following sections detail specific examples of the human dimension of general relevance within Asia. As of mid-2000, over 3.6 billion people, roughly three-fifths of the total population of the globe, resided in Asia. Seven of the world's 10 most populous countries - China, India, Indonesia, Russia, Pakistan, Bangladesh and Japan - are located within Asia (ADB, 2002). The majority of the region's population growth is forecast to come from South Asia, which expects to add 570 million people in India, 200 million in Pakistan and 130 million in Bangladesh over the next 50 years (UN-DESA-PD, 2002). Population growth, particularly in countries with already high population densities, is inextricably associated with the increasing pressure on the natural resources and the environment as the demands for goods and services expand. Some of the key impacts of increasing population include those linked with the intensification of use of natural forests including mangroves, agriculture, industrialisation and urbanisation. In Asia, the pressure on land in the 21st century will increase, due to the increasing food grain demand for the growing population, the booming economic development, as well as climate change. This will be exacerbated by the increasing scarcity of arable lands as a result of using vast agricultural lands to support industrialisation and urbanisation in pursuit of economic development (Zeqiang et al., 2001). In the developing regions, the remaining natural flood plains are disappearing at an accelerating rate, primarily as a result of changes in land use and hydrological cycle, particularly changes in streamflows due to climatic and human-related factors. The future increase of human population will lead to further degradation of riparian areas, intensification of the land and water use, increase in the discharge of pollutants, and further proliferation of species invasions. The most threatened flood plains will be those in South and South-East Asia. In some parts of South-East Asia, population growth, particularly in the uplands, continues to exert pressure on the remaining forests in the region. Encroachment into forest zones for cultivation, grazing, fuel wood and other purposes has been a major cause of changes in natural forests. In the Philippines, forest degradation has been attributed partly to upland farming (Pulhin et al., 2006). Development, to a large extent, is responsible for much of the greenhouse gases emitted into the atmosphere that drives climate change. On the other hand, development greatly contributes in reducing vulnerability to climate change and in enhancing the adaptive capacity of vulnerable sectors. Demands for biological resources caused by population and increased consumption have grown with increasing economy and fast development all over Asia in recent years. Rates of both total forest loss and forest degradation are higher in Asia than anywhere else in the world. The conversion of forested area to agriculture in Asia during the past two decades occurred at a rate of 30,900 km2/yr. In many developing countries of Asia, small scale fuel wood collection and industrial logging for exports of timber and conversion of forests into estate crop plantation (i.e., oil palm) and mining are also responsible for deforestation. It is likely that climate change would aggravate the adverse impacts of forest cover loss. In Asia, migration accounts for 64% of urban growth (Pelling, 2003). Total population, international migration and refugees in Asia and the Pacific region are currently estimated to be 3,307 million, 23 million, and 4.8 million, respectively (UN-HABITAT, 2004). Future climate change is expected to have considerable impacts on natural resource systems, and it is well-established that changes in the natural environment can affect human sustenance and livelihoods. This, in turn, can lead to instability and conflict, often followed by displacement of people and changes in occupancy and migration patterns (Barnett, 2003). Climate-related disruptions of human populations and consequent migrations can be expected over the coming decades. Such climate-induced movements can have effects in source areas, along migration routes and in the receiving areas, often well beyond national borders. Periods when precipitation shortfalls coincide with adverse economic conditions for farmers (such as low crop prices) would be those most likely to lead to sudden spikes in rural-to-urban migration levels in China and India. Climatic changes in Pakistan and Bangladesh would likely exacerbate present environmental conditions that give rise to land degradation, shortfalls in food production, rural poverty and urban unrest. Circular migration patterns, such as those punctuated by shocks of migrants following extreme weather events, could be expected. Such changes would likely affect not only internal migration patterns, but also migration movements to other western countries. Food can be produced on currently cultivated land if sustainable management and adequate inputs are applied. Attaining this situation would also require substantial improvements of socio-economic conditions of farmers in most Asian countries to enable access to inputs and technology. Land degradation, if continued unchecked, may further exacerbate land scarcities in some countries of Asia. Concerns for the environment as well as socio-economic considerations may infringe upon the current agricultural resource base and prevent land and water resources from being developed for agriculture (Tao et al., 2003b). The production losses due to climate change may drastically increase the number of undernourished in several developing countries in Asia, severely hindering progress against poverty and food insecurity (Wang et al., 2006). Table 10.7. A summary of projected impacts of global warming on industries and energy sectors identified in Japan. is likely to amplify some of these stresses (Honda et al., 2003), although much of the interactions are not yet well understood. For example, it has been suggested that climate change will exacerbate the existing heat-island phenomenon in cities of Japan by absorbing increased solar radiation (Shimoda, 2003). This will lead to further increases in temperatures in urban areas with negative implications for energy and water consumption, human health and discomfort, and local ecosystems. Vulnerabilities of urban communities in megacities of Asia to long-term impacts of projected climate change need to be assessed in terms of energy, communication, transportation, water run-off and water quality, as well as the interrelatedness of these systems, and implications for public health (McMichael et al., 2003). Nature-based tourism is one of the booming industries in Asia, especially ski resorts, beach resorts and ecotourist destinations which are likely vulnerable to climate change; yet only a few assessment studies are on hand for this review. Fukushima et al. (2002) reported a drop of more than 30% in skiers in almost all ski areas in Japan except in the northern region (Hokkaido) and high altitude regions (centre of the Main Island) in the event of a 3°C increase in air temperature. If the mean June to August temperature rises by 1°C in Japan, consumption of summer products such as air-conditioners, beer, soft drinks, clothing and electricity are projected to increase about 5% (Harasawa and Nishioka, 2003). Table 10.7 lists a summary of projected impacts of global warming on industries and energy sectors identified in Japan. Limited studies on the impacts of climate change on the energy sector in Asia suggest that this sector will be affected by climate change. In particular, South Asia is expected to account for one-fifth of the world's total energy consumption by the end of 21st century (Parikh and Bhattacharya, 2004). An increase in the energy consumption of industry, residential and transport sectors could be significant as population, urbanisation and industrialisation rise. It is likely that climate change will influence the pattern of change in energy consumption that could have significant effects on CO2 emission in this region. The cost of damages from floods, typhoons and other climate-related hazards will likely increase in the future. According to the European insurer Munich Re, the annual cost of climate change-related claims could reach US$300 billion annually by 2050. The Association of British Insurers examined the financial implications of climate change through its effects on extreme storms (hurricanes, typhoons and windstorms) using an insurance catastrophe model (ABI, 2005). Annual insured losses from hurricanes in United States, typhoons in Japan and windstorms in Europe are projected to increase by two-thirds to US$27 billion by the 2080s. The projected increase in insured losses due to the most extreme storms (with current return periods of 100 to 250 years) by the 2080s would be more than twice the reported losses of the 2004 typhoon season, the costliest in terms of damage during the past 100 years. The cost of direct damage in Asia caused by tropical cyclones has increased more than five times in the 1980s as compared with those in the 1970s and about 35 times more in the early 1990s than in 1970s (Yoshino, 1996). Flood-related damages also increased by about three times and eight times respectively in the 1990s, relative to those in the 1980s and 1970s. These trends are likely to persist in the future. Social vulnerability is the exposure of groups of people or individuals to stress as a result of the impacts of environmental change including climate change (Adger, 2000). Social vulnerability emphasises the inequitable distribution of damages and risks amongst groups of people (Wu et al., 2002) and is a result of social processes and structures that constrain access to the resources that enable people to cope with impacts (Blaikie et al., 1994). The poor, particularly in urban and urbanising cities of Asia, are highly vulnerable to climate change because of their limited access to profitable livelihood opportunities and limited access to areas that are fit for safe and healthy habitation. Consequently, the poor sector will likely be exposed to more risks from floods and other climate-related hazards in areas they are forced to stay in (Adger, 2003). This also includes the rural poor who live in the lower Mekong countries and are dependent on fisheries as their major livelihood, along with those living in coastal areas who are likely to suffer heavy losses without appropriate protection (see Table 10.10; MRC, 2003). Protection from the social forces that create inequitable exposure to risk will be as important if not more important than structural protection from natural hazards in reducing the vulnerability of the poor (Hewitt, 1997).